The Zosi High Resolution Security System is one of the popular systems which have satisfied many customers. Positive reviews have been received from the customers. Let us see if investing in this product is profitable. 8 day or night, high resolution, weatherproof CCTV Security Cameras. They possess 900 TVL (television lines) which indicates the resolution of the scene captured by them. They are coupled with a 1 TB (terabyte) Hard Drive Disk. These cameras record in H.264 video compression format. An 8CH Digital Video Recorder (DVR) Kit is included which supports 1 TB of memory. Two power supplies of ratings 12 V/2000mA are provided for camera and one for the DVR. An instruction manual for camera, user guide for DVR, one remote control for DVR, a mouse for DVR, one 1TB HDD, 8 warning stick, 8 mounting screw bag, two 1-4 power splitter cable, 8 60 FT BNC and DC CCTV cable for the camera. The device comes with an instruction manual and user guide which will help you. The device comes with a DVR which is easy to install. You can choose the primary areas for placing the camera. Each camera should be attached with a power source and to the DVR using the BNC (Bayonet Neill-Concelman) connector given. After the process is done, connect the DVR with a monitor where it shows the recording. The package contains a remote and mouse for controlling the DVR. The P2P (Peer-to-peer) technology can also be used to connect to your DVR. To access the security system a specialised QR (Quick Response) code is used to identify the user. So, wherever you are, you can have access to the DVR. The wireless remote can help you operate the DVR at a distance. The Resolution is unexpectedly superb! The 8 CCTV cameras possess 900 TVL. The resolution is represented by Vertical resolution lines which in this case is 900. Customers were not expecting a high quality camera for such a price. Therefore, use an at par monitor to reflect the recordings. Otherwise, these CCTV cameras will lose its charm. 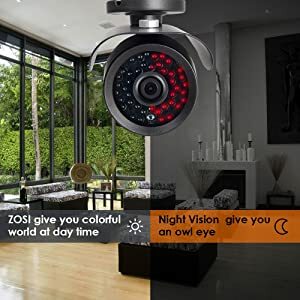 This Zosi product provides CCTV which will work for 8 day/night straight. This device is coupled with 1TB HDD. Therefore, this long duration counts. It has night vision which works for the dark time as well. The IR lights execute their job perfectly up to 120ft (40m). The lens on this device is 4.6mm. The image sensor on this product is 1/3” Colour CMOS with IR-Cut. They have an aluminium casing. The CCTV cameras are weatherproof. So, it is workable for outdoor surveillance as well. It has a waterproof level of IP66. Hence, install the 8 cameras wherever you want. The DVR operates on the LINUX system. It has 1 SATA ports which can house 3 TB data. The DVR supports 4 audio inputs and 1 audio output. The same Input/output ratio applies to the alarm feature as well. It is an 8CH DVR which works well. The installation process is not very troublesome. To use a computer to monitor the system, use Windows, IE and ActiveX. This Zosi product comes with a warranty of 1 year. The device is equipped with motion detection of unit 10. It sends e-mails on detecting motion. The image quality of this product is quite good. Moreover, there is no noise while scrolling. It has a large memory space. So you can view the recordings as well. Therefore, this security system is equipped with features that will gratify you. The wires are long enough to make the connections between the CCTV cameras and the DVR. The BNC and DC connectors come along to complete the package. The added advantage of this product is that the DVR comes with 8 channels. This means that all the eight cameras can be viewed on the screen. This helps to use only one monitor for scrutiny. The unique feature is the use of QR code. By using any app based on security system, one can access the security system, by using the QR code which will be generated. Thus, you can be assured of the safety at you home by logging in using the QR code. Hence, the product is a gift to the society. The ability to replay the recordings comes quite handy in various situations. Be it theft or any criminal offense, security cameras have become necessary. 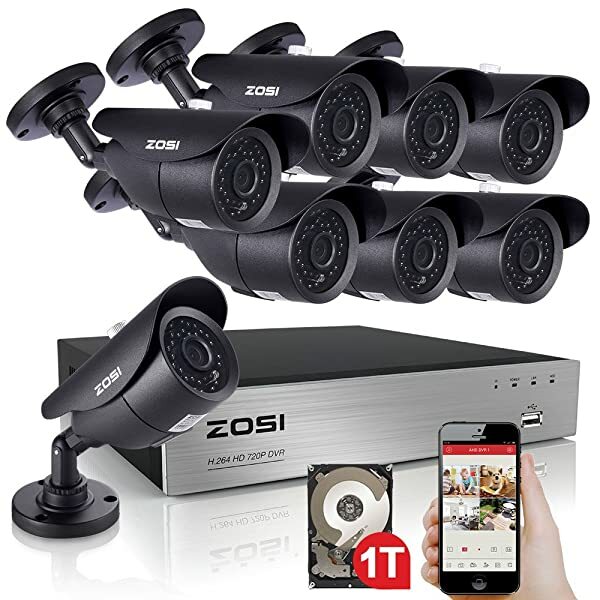 The Zosi High Resolution Security System provides the best at a low price. Customers have declared this product as worthy and suitably priced. The product has made a mark in the market. It helps people sleep at night. The fear of security always lingers. But this product strives to remove it. Get it and see for yourself! I wish you could tell the buyer how to set the camera up without trouble. I would be nice if you would tell how to do it step by step.